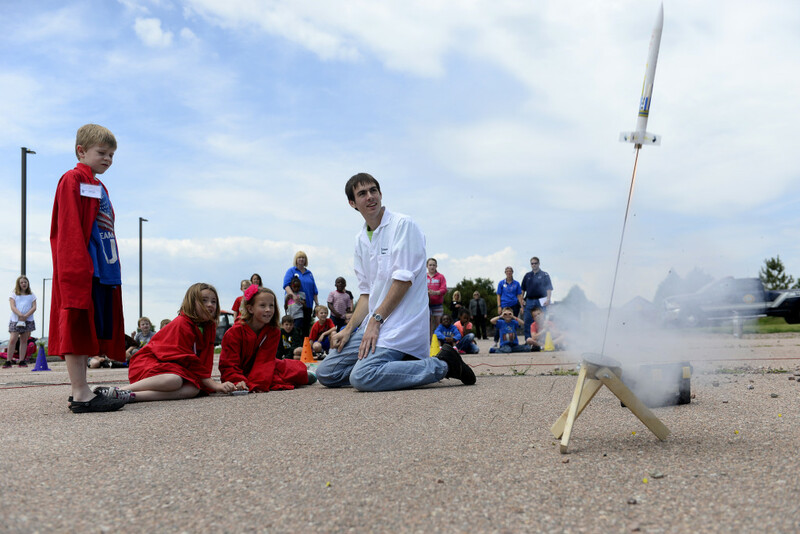 July 8, 2015 – The Schriever School Age Program capped off its Science Camp by launching several model Estes rockets on July 2. The launches were the final part of a mock event designed to help students learn about multiple scientific disciplines. Birchenough said the crisis is a meteorite strike and students must use the scientific method to determine exactly what happened. Each day is dedicated to using a different science to help solve various problems that occur as a result of the strike. “A lot of day one is on scientific method, [which they then apply] to find out what happened,” Birchenough said. The rest of the week covers topics such as robotics, biology, electronics, astronomy and rocketry. In addition to the rockets, students also built LEGO robots (in order to pick up radioactive materials for testing) and dissected frogs (to learn if material from the meteorite had caused infections in local wildlife). The Schriever SAP is open to children ages 5-12, who have started kindergarten. Children of active duty military, reservists on active duty orders, Department of Defense appropriated and non-appropriated fund employees and contractors working on Schriever are eligible to attend. The summer program will continue until Aug. 14. Before and after school care and daily school bus transportation is available to children attending Ellicott School District 22. Children residing in other districts are eligible for care on scheduled school closures and snow days. For more information, or to register your child, contact Rygiel at 567-4742.